We're starting a new series on Ruby + Swallow called "Tuesday Tips". 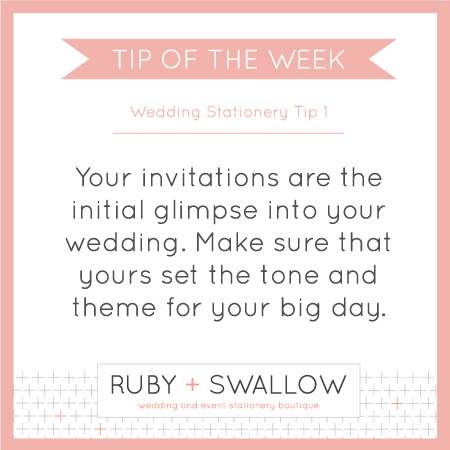 Every Tuesday we'll be sharing a simple tip with all of our readers about our favourite subject: wedding stationery. These will include things we have learnt from listening to our clients and working in the industry for the past two years. Each tip will be simple and bite-sized! Some may seem obvious, but what we've learnt is that we take a lot of our own knowledge for granted because not everyone knows everything about wedding stationery :) We hope you enjoy the series, and please send us your feedback if you have any. Without further ado, here's our first tip!